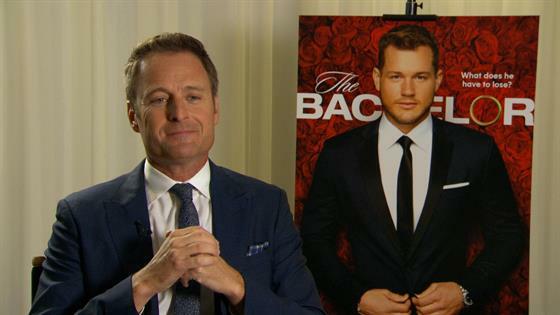 Chris Harrison Talks About the New Contestants on "The Bachelor"
It's a very diverse, interesting, dynamic group of women." Well, when you have a Cinderella, a sloth, two Miss USA competitors and two Hannahs from Alabama, we think it's safe to say interesting is the perfect word Chris Harrison could've used to describe The Bachelor's new batch of contestants. With the premiere of Colton Underwood's season less than a month away, ABC released the photos and bios of the 30 women Bachelor Nation will be meeting in season 23. And after checking out their job titles and interests, it's safe to say this might really be the most dynamic group of contestants the reality hit has ever given us. But when E! News caught up with Chris Harrison after he officially revealed the identities of the ladies, he also called the season 23 cast "a very smart group of women that kind of puts Colton on notice." But he does have a tell viewers will eventually pick up on. "Personality-wise, he's easy to figure out," Harrison teased, "He likes a strong, independent, powerful woman who is going to keep him on his toes." Instagram Bio: "Caare Rescue 🐶 The K9 Guard 🐶 @caarerescue @caarerescuewpg @thek9guard"
ABC Bio: "Alex is the proud owner of a successful dog rescue business, which takes her all over the world in search of four-legged friends to save. To date, she's saved almost 5000 dogs from slaughter. Luckily for Alex, rumor has it Colton is a dog lover too." What We Learned: Our first contestant basically kicks off the "private on Instagram" trend that many of Colton's ladies have adopted so far. Smart for them, not fun for us! But we humbly suggest you beef up your Linkedin! Especially because you created the K-9 Guard Jacket, which she created with her half-sister, and it's pretty darn cool. She also works for CAARE (Companion Animal Advocacy & Rescue Effort), so expect to see her bond with Colton, a big dog lover. ABC Bio: "A New England girl through and through, Alex was born on Cape Cod, went to college at University of Massachusetts and now lives in Boston. When she's not cheering on the Patriots or the Red Sox, she's working as an account manager for an IT staffing agency. Alex talks fast, but tends to move slowly...verrrrrrrrrrry slowly." What We Learned: Homegirl self-identifies as a sloth! What more do you need to know?! Well, she doesn't post too often on any social media platform, but when she does post on Instagram it's usually a group shot with friends, which is kind of refreshing? No sloth sightings on her page, but she does have a cute AF dog named Dexter. ABC Bio: "Angelique is a small-town Jersey girl with a love of corny jokes. Here's one for you, Angelique: Why did Colton cross the road? To meet you, of course!" What We Learned: Not much as even local New Jersey coverage of the cast announcement just highlighted her love for corny jokes and we couldn't find her on Linkedin, the obvious go-to after we discover someone is private on Instagram. Instagram Bio: "mke ... nyc ... yes i have 7 dogs ... snapchat - anniereardon ... colossians 3:12 ... 'i am beyoncé always' - michael scott"
ABC Bio: "Annie grew up on a farm in Wisconsin where she learned to ride horses. She competed in nationals for horse riding before attending the University of Alabama to study finance. Annie loves country music and swing dancing. She's hoping to sweep Colton off his feet!" What We Learned: She just graduated from the University of Alabama, and we feel old, so very old. She currently works for Bloomingdale's and studied abroad in Italy during her time in college. Along with seven dogs, she also has three horses. Oh, and she was one of the three ladies that got to meet Colton early on Ellen, playing to the Bachelor's love for dogs as her first impression strategy. Instagram Bio: "Beauty is not in the face, beauty is in the light of the heart ... Represented at Newmark (LA)"
ABC Bio: "A model from Southern California, Bri is much more than just a pretty face. She played soccer for eight years, enjoys hiking and camping, and loves to hit the snowboard slopes. Her biggest dating fear? Farting too loudly. (Don't worry Bri, we won't tell Colton.)" What We Learned: From her modeling page, we learned she's 5'8" and her shoe size is 7.5. Riveting stuff, but she's private on Instagram and kind of a social media ghost otherwise. Instagram Bio: "23 | Charlotte | Miss North Carolina USA ‘18 |"
ABC Bio: "Caelynn grew up in Fredericksburg, Virginia, and attended Virginia Commonwealth University, where she got her degree in broadcast journalism. She was named Miss North Carolina in 2018 and was the first runner-up at Miss USA. But Caelynn is not your typical beauty queen. She once flew to Japan for a first date! Luckily, she'll only have to travel to the Bachelor mansion to meet Colton." What We Learned: One of two pageant winners competing this season, she's the reigning Miss North Carolina and is using her platform to speak up against sexual assault. She revealed she was sexually assaulted by two of her friends when she was attending Virginia Commonwealth University. During a press conference after her win, she said she hoped to help others after going through the experience herself with no idea of what to do. "I didn't know what you should do when you report, I didn't know what my rights were, I didn't know what the process was," she said, with improving Title IX policies on college campuses being her main goal. Instagram Bio:"PSR Brokerage x Starke Realty Team ... 25 ... Toronto Realtor ... Western U Alumni"
ABC Bio: "Caitlin is a successful realtor from Toronto, Ontario, Canada, who enjoys photography, painting and singing in the shower. Here's hoping she musters the courage to belt out a few tunes in front of Colton...or, maybe not?" What We Learned: She recently became a real estate agent (The website is...interesting! )...so take from that what you will in regards to how she does on the show. Fun fact: she's one of only two Canadians competing this season. Instagram Bio: "hb | slp grad student | psalm 46:10"
ABC Bio: "A true native Californian, Cassie grew up at the beach and is an avid surfer. She is currently completing her degree in speech pathology and hopes to one day open up a private practice to work with kids. Maybe in the meantime she can teach Colton the language of love." What We Learned: Random, but her little sister is currently dating the actor Gregg Sulkin (aka Bella Thorne's ex). Aside from that fun fact, Cassie loves to surf and go to Stagecoach (aka Country music's Coachella), so yes, definitely from California. ABC Bio: "By day, Catherine is a successful commercial real estate agent. By night, Catherine is DJ Agro—an up-and-coming hip-hop DJ making a name for herself on the Ft. Lauderdale club scene. Along with her dog daughter, Lucy, Catherine is hoping to spin her way into Colton's heart." What We Learned: So far, she was the only contestant to post her official pic from the show to her Instagram page, which isn't private. She loves going to Burning Man and volunteers for St. Judes Children's Hospital. Instagram Bio: 20 something | Atl, Ga ...SheEO: Creating Court, LLC. @cookingwithcourt_ @creatingcourt_"
ABC Bio: "Courtney was born in Wiesbaden, Germany, but grew up in McDonough, Georgia, with four younger siblings. She turned her passion for food and cooking into a successful catering business, crafting healthy meal plans for athletes. Now she's just hoping she has the recipe for love with Colton!" What We Learned: This Gemini runs a food blog, so clearly, she's a keeper. She usually features Cajun style meals, and her blog receives 3,000+ monthly viewers, according to said blog! She also writes about style, interior design and being a business owner. Instagram Bio:"You can't spell DIME without DEMI...The North remembers ... 23 / DALLAS, TX"
ABC Bio: "Demi grew up in rural Texas and is a proud country girl. She loves ATVing, fishing and watching WWE. She can also drive a stick shift. She's ready to put her pursuit of Colton into overdrive! Keep an eye on this one, Bachelor Nation!" What We Learned: She has a very solid Instagram handle: @demi_not_lovato. Her favorite movies, per Facebook, are Dear John, The Sandlot and Despicable Me 3, so she has range! She also loves Jersey Shore and Game of Thrones, so basically, she has perfect taste. Don't @ us. She's also an aspiring model and actress. Instagram Bio: "Libra Sun, Leo Moon, Gemini Rising ... GA"
ABC Bio: "Devin graduated from Arizona State University with a Master of Arts in sports journalism. She currently works as broadcast journalist for a local news station in Medford, Oregon. When she's not reporting, you can find her doing her best sun salutation in yoga class. Namaste, Colton!" What We Learned: She is the weekend anchor at KOBI 5 News in Medford, Oregon, and is hoping to make the transition into sports and entertainment-focused hosting gigs. (Our next Rachel Lindsay maybe?) She volunteers at her church, and was in Pi Sigma Epsilon when she attended the University of Georgia before going on to ASU. And it seems like sports is her biggest interest, as it's really all she tweets about aside from local news for her gig. And, because we're judging things based solely on social media (So, you know, it's a day that end in -y! ), we're thinking Devin isn't Colton's final lady, just because a recent Instagram caption revealed she's listening to Ariana Grande's "Thank U Next" on repeat. Instagram Bio:Makeup Artist in Scottsdale, AZ ... elysedehlbom@gmail.comBe like the pineapple ... Stand tall. Wear a crown. Be sweet on the inside." ABC Bio: "Elyse grew up outside of Anchorage in Soldotna, Alaska, where she spent her childhood ice-skating and snowmobiling. She found warmer a climate when she relocated to Scottsdale, Arizona, where she now works as a makeup artist. She also he enjoys hiking, reading and spending time with friends over good food and wine." What We Learned: She is a freelance makeup artist who also is a sunless tanning technician and lash extension artist, so if nothing else, she will totally win Miss Congeniality this season as all of the other women will surely be hitting her up for help. Before going out on her own, she worked at Sephora. Instagram Bio: "Eat like no one is watching ... Travel nurse recruiter at Aya Healthcare"
ABC Bio: "'The Nut,' as she's known to her friends, is a ball of energy with a great sense of humor. Erika boasts that one of her talents is being able to eat whatever she wants without gaining weight. What's your secret, Nut?" What We Learned: She's an alumni of Alpha Chi Omega and graduated from California State University San Marcos. Oh, and she once worked at Starbucks. ABC Bio: "Erin works full time for her stepmother's home improvement business. She's not afraid to get her hands dirty but cleans up nicely. When she's not working, Erin enjoys ballroom dancing (as long as it's not too late of a night). Erin also loves expensive shoes but admits she can do a better job keeping track of them. She loves pumpkin spice lattes." What We Learned: Well, we got exactly what we expected from a woman whose job title was "Cinderella" and their bio ended with their love for PSLs. (Basic b--ches unite!) Her favorite time of year is fall and she is obsessed with her dog. And while she doesn't tweet a lot (and hasn't recently), when she does, it's all about sports. Instagram Bio: Hi. I'm Alabama Hannah...I love Jesus with my whole heart. Miss AL USA '18." ABC Bio: "Born and raised in Tuscaloosa, Alabama, Hannah was bred to be a proud member of the Alabama Crimson Tide. Following in her parents' footsteps, she recently graduated from the University of Alabama with a degree in communications. She currently works as an interior designer and never misses an Alabama football game. Oh, and in her spare time this year, she won the title of Miss Alabama USA 2018. Roll Tide, Hannah!" What We Learned: She's the reigning Miss Alabama! In an interview after her win, she revealed she had dealt with anxiety and depression, which caused her to take some time off from pageants. "In that moment, it is so hard to see joy in life. I can remember times where I didn't want to get up," she told Alabama NewsCenter. ""It was a whirlwind coming back into it...(but) I was 100 percent Hannah and didn't have a care in the world, and that's why I think I won." And according to a profile on a pageant site, Hannah battled a childhood illness and suffered the "loss of loved ones to homocide," so those might be topics addressed during her time on The Bachelor. Instagram Bio: " snapchat: hgodwin1758 - block agency + mp atl - hannahg1758@gmail.com"
ABC Bio: "This sweet Southern belle definitely isn't camera shy—she's both the photographer and model for her burgeoning social media business. Apart from planning the photo shoots for her next posts, Hannah enjoys being a foodie and glamping. Hopefully Colton 'likes' what you're putting down, Hannah!" What We Learned: Social media influencer alert! She's already ahead of the game on the spon-con game, giving us Lauren Bushnell vibes. (Think lots of bikinis, lots of fast food, lots of clothing #ambassador pics, etc.) She was in Darius Rucker's 2017 video for "For the First Time," and Thomas Rhett's "Leave Right Now" video. She also has her own website, where she occasionally blogs. Here's the beginning of an August post about her journey into modeling and influencing: "I don't consider myself to be a so called 'model'. I consider myself to be Hannah, who happens to like the creative aspect of social media & modeling in general!" She was in Phi Mu at the University of Montevallo. Instagram Bio: "do justly - love mercy - walk humbly"
ABC Bio: "Born and raised in San Diego, California, Heather is a Southern California girl through and through. She's a thrill-seeker who enjoys bungee jumping, skydiving and river-rafting. But out of all the thrilling things Heather's done, there's still one thrill she's yet to experience—she's never kissed a boy!" What We Learned: Per Reality Steve, she actually met Colton pre-Bachelor...but it seems like it was just a casual fan meeting. Her caption of the pic? "Virgins all around," which makes total sense now that we know she has never kissed someone. ABC Bio: "A native to Los Angeles, Jane is a free spirit with infectious energy. As a social worker, she uses her positive vibes and good nature to help care for seniors at an elderly day care facility. When she's not at work, Jane loves spending time with her mom and her dog, Bella." What We Learned: You guys...a contestant having two first name is proving very difficult to track the social worker down on social media. We have failed Bachelor Nation, and for that, we are truly sorry. Instagram Bio: "Los Angeles | Forever LSU | James 1:19"
ABC Bio: "A lifelong dancer, Katie attended Louisiana State University where she competed on the dance team. After moving to Los Angeles to work as medical sales rep, Katie settled in Sherman Oaks, where she enjoys yoga and sushi. She still dances in her spare time, and hopes to teach Colton a few moves." What We Learned: One of the three ladies that got to meet Colton early on Ellen, Katie is a medical sales rep who seems to do some photography on the side. And she was one of the co-captains during her time as an LSU Tiger Girl...and yeah, ABC pretty much got it all! ABC Bio: "This beautiful and spunky California girl works for her dad's dentistry business as a dental hygienist. She loves hiking, reading, cooking and swimming. Her one deal breaker? Colton better floss." Instagram Bio: "find yourself, and be that"
ABC Bio: "Originally from El Paso, Texas, this beautiful girl-next-door once moved to Spain on a whim. Luckily for Colton, she moved back and is ready to put her heart on the line for love." What We Learned: She currently has ZERO posts on Instagram. We are confused, fascinated and bewildered. But moving on...she went to Texas State where she was part of the Baptist student ministry, participated in intramural sports and was a member of Loud Crowd, the school spirit org. Instagram Bio: "Digital Journalist | Caption queen"
ABC: Bio: "Nicole is a fun and energetic Miami native who loves salsa dancing and singing a capella. Her family is originally from Havana, Cuba, and she's extremely proud of her roots. She lives at home with her brother, mom and grandma and can't wait for Colton to try some of her grandma's cooking." Insta Bio: "Cisco AM | Travel enthusiast | TCK"
ABC Bio: "Nina was born in Croatia and moved to the United States with her mom when she was nine years old, fleeing the conflict there amidst bullets and bombs. Amongst her many hobbies, Nina enjoys kayaking and hiking. She's also watched The Bachelor with her mom and grandma for years." What We Learned: Linkedin was our go-to here as her Insta was private, and we learned she's shockingly normal. She's been a sales account manager for three years, went to Meredith College, and she speaks three languages (English, Spanish and Croatian). She also volunteers for the Raleigh Rescue Mission and the Wake County Animal Shelter. Insta Bio: "time is precious, waste it wisely"
ABC Bio: "Onyeka grew up in Manhattan, Kansas, in a loving family. Her parents are originally from Nigeria and have been married for 35 years. Fun fact: Her parents got engaged after just two weeks. Onyeka is hoping to have that same kind of luck with Colton." What We Learned: While her Insta is (say it with us now!) private, the one she runs for her dog, Smokey, is not. Her Twitter isn't private (her bio is "I prefer my puns intended"), but she doesn't really tweet that much (probably because she just started a new account in September), but when she does she is pretty funny. "Is eating a salad for lunch then a box of cookies for a snack considered good balance or is that a myth?? Asking for myself," she posted. She doesn't follow Colton, but she does follow Kaitlyn Bristowe, JoJo Fletcher, Becca Tilley and Sean Lowe. Oh, and she was Pi Beta Phi at Kansas State, if you're into that sort of thing. Insta Bio: "texas gal living in LA ... adventure seeker cosmetic dermatology | nurse for @simonourianmd1"
ABC: Bio: "Revian is an esthetician from Los Angeles. When she's not helping people feel beautiful, she loves to attend music festivals. She's also fluent in Mandarin." What We Learned: As sort of a micro-influencer on Instagram, Revian is already pretty strong at the spon-con game. Her longest relationship so far has been with her dog (four years! ), and she does NOT like her job title being listed as "esthetician," clarifying on her Instagram Stories that she is an "aesthetic nurse." She was also a Kappa Delta when she attended the University of Texas at Austin. Insta Bio: "NYC |Professional Dancer MSA | Senior Instructor Physique 57 | Model Bella Agency |"
ABC Bio: "Sydney has danced since she was three years old and is currently a professional dancer for an NBA team. She's had great success in her career, but hasn't been as lucky in love. She's never had a boyfriend!" What We Learned: Bless you, Syd, for not making your Insta private. She loves her dog, she loves working out (she is a barre instructor, so she knows pain), and she loves working as a dancer for the New York Knicks! Just like Sarah Jessica Parker in Girls Just Wanna Have Fun, she loves to dance. And via her Linkedin, Sydney said she is "a hard worker and strive to do my very best in any work I do. I continue to seek new opportunities to learn and grow and expand upon each day as a working professional and member of the performing arts community." Sounds like a winner, Colton! Insta Bio: "you see in the world what you have in your heart"
ABC Bio: "Tahzjuan grew up in Houston but moved to Colorado with her mom, brother and two dogs. She loves reading, outdoor concerts and shopping with her mom. Fun fact: She has a tattoo that say "I love bad ideas." Hopefully, Tahzjuan only sticks to her good ideas when it comes to Colton." Insta Bio: "Psalm 46:5" and "Vous êtes votre seule limite" (It translates to You are your only limit"
ABC Bio: "This Southern California girl is definitely not the squeamish type—she draws blood for a living! When she's not filling up vials for her patients, she volunteers at her church and goes wine tasting. Unlike her patients, Tayshia hopes Colton feels faint when he sees her!" What We Learned: Another private Instagram account! But via her Linkedin, she went to Concordia University Irvine and was in Phi Delta Epsilon. Now, she works in human resources, but her first job was at Abercrombie & Fitch and she worked there for four years. Insta Bio: "Wardrobe stylist" and "NY --> LA"
ABC: Bio: "Originally from New York, Tracy relocated to West Hollywood to pursue a career in wardrobe styling. When she's not helping celebrities look their best, she's traveling the world with her sister. She'll be helping Colton with fashion tips all season long." What We Learned: Welp, Reddit did some of the hard work for us, posting alleged old tweets of Tracy's that used the R-word, fat-shamed strangers and seemingly based the show she would one day end up on. (Us Weekly reported on the old tweets.) Since then, her Twitter has been deleted, ditto her Facebook, and her Instagram is private.